Hotel ibis budget Aachen City. Book online now! Free Wifi! 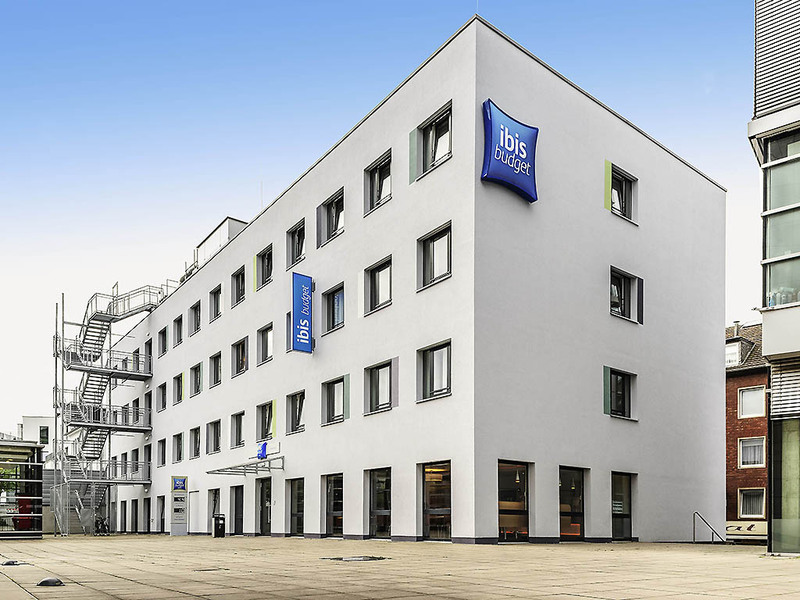 The ibis budget Aachen City is a stone's throw from the old town and has 85 air-conditioned rooms featuring the award-winning Cocoon & Design style. Choose between Standard Rooms (French bed and bunk bed) and Twin Rooms (two single beds). All rooms have shower, WC, desk and flat-screen TV. Free WIFI is available throughout the hotel. Our hearty buffet breakfast is the perfect start to your day. Our modern, comfortable rooms can accommodate up to 2 adults and 1 child under the age of 12 and are equipped with a French bed and bunk bed or twin beds, as well as a shower, toilet, desk and satellite TV. A practical place to get a sleep! The location is perfect in the city center, with a 9 € per day park garage just nearby. Late night, there are from both side the hotel ”front and back” a lot of homeless which hives some creepy feeling! The bed is ok and big. Not for families but good for whom need just a good bed in the city center. In some corner in the room, there were some spider's nets. This is my second time here, and the girl in the reception still not friendly like the first time! As usual, reasonable value for money, predictable. I stayed overnight at ibis budget aachen city. It is within 15 minutes walking distance from the main train station, has simple and clean rooms without "luxury"(which i don't need anyway), and offers a reasonably good breakfast - no feast, but again: I stayed there for business and would not spend more than 20 minutes fro breakfast anyway. I also like the exklusive use of door codes both for the building and for the room - no hassle with pickiing up keys at the reception desk, no worrying that it might be closed when arriving late, either. Everything fine in the room (clean, spacey). Perhaps the toilet could be a bit bigger (if you sit, you can touch the door with your head and knees). Very nice to have a discount for the car park right underneath. The breakfast is quite basic (eg. no croissant, no real bread except the buns and toast slices), but the coffee was good. The service in general was sufficient and the staff polite and friendly. Hotel looked new and the room was smart and nicely decorated. There was one double bed and one single bed but the double bed had a single quilt which didn't even cover the bed completely. I complained about this but was told it was standard?? Anyway, I got used to it. Very friendly management, clean, calm and central. I recommend for everyone who think for their budget. If you are used to stay in other Ibis Budget hotels, you won't have any suprises with this hotel. The room is small, but clean and new, and we got what we paid for. The only problem we had was that we left in the morning to have breakfast outside the hotel and when we came back our password worked to unlock the main door (so we got inside the hotel), but it didn't work to unlock our bedroom door (although we still had 1h30 left for the check-out). Since the reception was close (they only work few hours in the day), we had to ask an employee that was cleaning a room in another floor to open our room for us. Easy check in but the room smelled so heavily of smoke, despite supposedly being smoke free. The hotel was easy to find and walking distance to the Christmas market. The room was clean and very simple but had everything we needed. Found it a tad warm but opened the window and all was good. The guests in room 214 played loud music till 3am in the morning. Me and my children could not sleep at all. And even when they turned the music off, they continued with their noise. Please ensure your guests have a restful night because me and my kids didn’t get it. Thank you. The interior decoration is not nice.